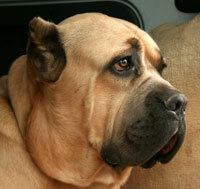 Cane Corso Dogs - The Cane Corso is an Italian breed of dog used mainly as a guard dog. It is of the large molosser type. The name means "Corso Dog", and if abbreviated should be called a "Corso" as Cane (pronounced kah-nay) simply means "dog" in Italian. Its ears are naturally dropped forward, but where legal, many breeders crop them short and close to the head so that the remaining stubs stand upright. Most Corsos have cropped tails as well. The standard calls for cropping at the 4th vertebra, although many are cropped shorter. The Cane Corso should be a confident dog, very devoted to its family, and not pose a threat to strangers welcomed into the home. He is easily trained and generally naturally protective of children. Since the breed is very smart and active, it is advised that owners find activities to stimulate the dog. If not, they may turn to your possessions in their boredom. They also often suffer from separation anxiety. A dog that is aggressive may be unstable but more probably is under-socialised. Early and consistent socialisation is a requirement for this breed. A well trained and socialised Corso is not only a good ambassador for the breed, but for canines in general. This information is licensed under the GNU Free Documentation License. It uses material from the Cane Corso article on Wikipedia.org. 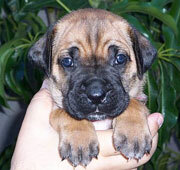 Cane Corso Breeders - Advertise your kennel puppies and dogs here. Pleasant Hill Kennels - Missouri - We have been a professional Cane Corso breeder for over 12 years and have shipped our pets to 32 states and 3 different countries.